Stand up paddle boarding combines the thrill of surfing and the ease of kayaking into one enjoyable water sport for any age. These NY paddle board rental companies offer hourly or daily rentals, lessons and yoga classes. Use our list below to find paddle board companies throughout New York. Serves the Entire NJ and NY Area! Jersey Paddle Boards is the best rental shop for stand-up paddle boards and kayaks in the village of Greenwood Lake. They are a family owned business serving any areas of NY and NJ. Their rental base and shop are located at beautiful Willow Point Marina found on Greenwood Lake. Jersey paddle boards is WPA certified, bliss paddle yoga and paddle fit instructors, world paddle association classes and clinics, all staff hold CPR, first aid and lifeguard credentials and are experienced SUP and kayakers, safe and user-friendly equipment, storefront with all your sup and kayak needs, and clubs, race teams and day trips to join for all levels. They offer Stand Up Paddle Board lessons as well as SUP yoga and Full moon paddles and Ladies night! Greenwood Lake has 9 amazing miles to explore as well as many restaurants to paddle right up to. NEW Location in Franklin, NJ Coming Soon! Stand up paddle board tours on the Hudson! 1995, they have provided kayak and stand up paddle board tours in the New York Harbor. They offer four different paddle board trips through New York City's water ways. 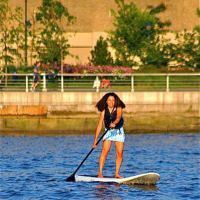 The short stand up paddle board trip is a one hour and fifteen minute tour that takes you to the Intrepid Sea, the Air and Space Museum, the Batter and the "Secret Beach" in Hoboken, NJ. This is the recommended tour if it is one of your first times paddle boarding. The long distance NY stand up paddle boarding tour is for experienced paddle boarders. 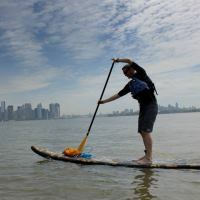 You have the choice to paddle board in the open water, south of the New York Harbor to the Verrazano Bridge or north of the George Washington Bridge to the Palisades Cliffs. The Manhattan Kayak Company also offers paddle board lessons, kids camps or rentals so you can explore the New York waterways on your own! Classes and tours offered 7 days a week! New York Kayak Company's beginner courses focus on the fundamentals of paddle boarding including where and how to stand, propulsion and maneuvering strokes and navigation. Once you've mastered these skills you can move onto the intermediate classes and tours that focus on skill refinement, efficiency and building stamina. 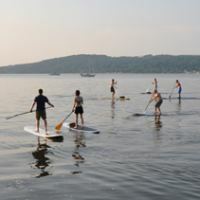 Take part in one of their guided paddle board tours through the Hudson River or rent a paddle board and explore on your own. Classes and tours are offered throughout the spring, summer and fall seasons. New York Kayak Company also offers stand up paddle board yoga! The one hour class blends traditional yoga moves with the challenge of balancing on the paddle board. Take part in their group classes or talk about scheduling a private session. Spend the day at Croton Point Park and participate in Kayak Hudson's newest program, Paddle Boarding! They offer four different programs for all levels. The Instruc-Tour is geared towards beginners. You'll learn all of the basics starting with on-land instructions and safety talk then you'll get in the water for stance, stroke and stopping lessons. Once you feel comfortable on the board the group heads out for a paddle. Kayak Hudson also offers a Sunset Instruc-Tour, which goes over all of the basics offered in the Instruc-Tour with the bonus of watching the sunset on the Hudson River. The Sunset Instruc-Tour is perfect for a romantic summer evening in New York! Paddle board throughout the waters of Croton Point Park on your own by renting a board by the hour. Private lessons are also available upon request. 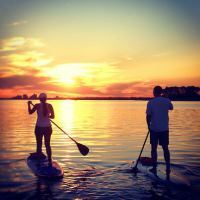 Skudin Surf offers paddle board lessons and rentals, plus yoga and core on the flat water of Reynold’s Channel in Long Beach NY. Lessons for ages 10 and up are offered from late-May through late-September and price includes paddle board, paddle and life jacket. Choose between a private, semi-private or group lesson for your comfort. Experienced paddle boarders can take part in Skudin Surf's SUP Meet Up, SUP Yoga or SUP Core. The Yoga and Core programs can also be offered as private lessons. Visit the website for a schedule and to register for any course.